Professor Aslı Ü Bâli evaluates the EU's approach to Syrian refugees. Law Professor Aslı Ü Bâli, director of the UCLA Center for Near Eastern Studies, inaugurated the fall lecture series on Transnational Migration at West Los Angeles College with a lecture titled ‘When is Migration a “Crisis”? Evaluating the EU’s Approach to Syrian Refugees.’ A record turnout of 120 faculty and students attended the lecture and stayed for nearly an hour afterward asking questions. Dr. Bâli’s analysis of the refugee situation sees it not as a humanitarian crisis, since adequate international resources are available for relief, and not as a refugee crisis, since several potential recipient countries could absorb the current refugees without economic strain. (The U.S. absorbed some 1.2 million Southeast Asian refugees in the aftermath of the Vietnam War since 1975.) Instead, the present situation is a crisis of international law. Current laws, institutions, mechanisms and policies are both under-enforced and ultimately inadequate. There is a lack of political will to develop long term solutions to the problem. Bâli offered three recommendations for overcoming the current and future impasses: (1) a worldwide campaign against xenophobia, (2) the development of a responsibility sharing paradigm so that international resources are mobilized early to frontline states absorbing large refugee flows; and recognition that honoring the refugee convention requires all states to provide a lawful route to sanctuary and resettlement. Since international will is strongly influenced by the United States, much of the impetus for these changes must come from the United States. 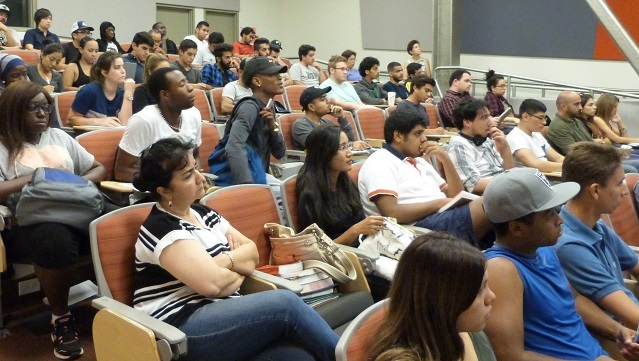 The new global studies program at West Los Angeles College offers Associate Degrees and Certificates in African, Asian, Latin American, Middle Eastern, and International studies, with separate tracks for students planning to transfer to the University of California or California State University. Three of the UCLA International Institute’s research units, the Center for Near Eastern Studies, the Asia Institute, and the Latin American Institute—with some support from the U.S. Department of Education’s Title VI program—are enriching the West L.A. College program through participation in outreach events such as the lecture series and an annual conference for high school and college teachers.